This entry was posted in DevOps, Release Engineering, Tech and tagged build, cloud, docker, jenkins, puppet, releng, ubuntu by Dan Tehranian. Bookmark the permalink. Nice write up Dan! 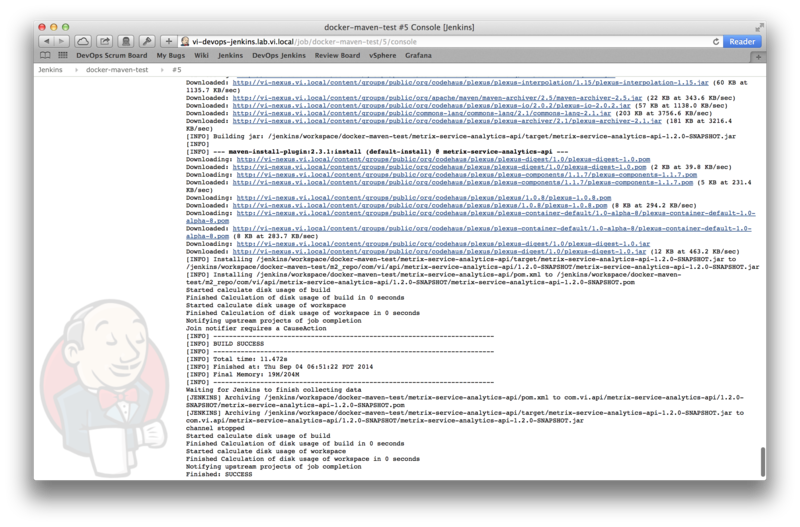 How did you managed to get the SLES 11 docker image to work on Ubuntu machines? They are using different kernel versions are they not? 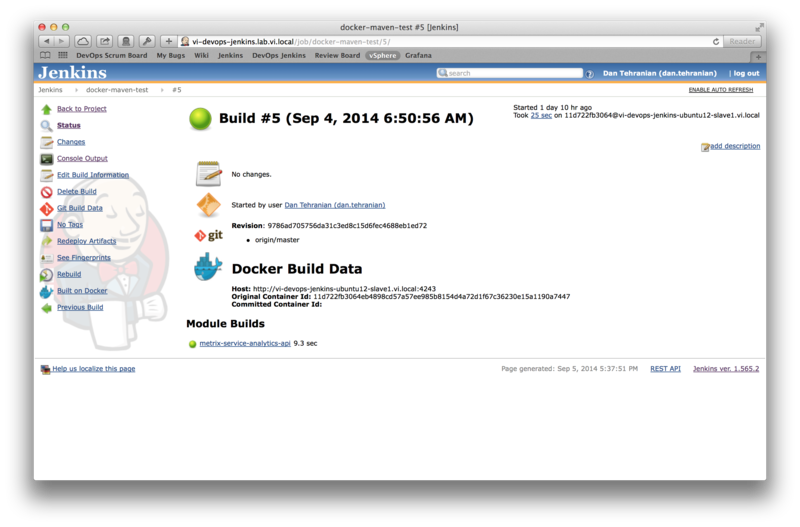 At the end you mentioned devs can use the Vagrant docker plugin to run the docker images. Is that what the Jenkins slaves are doing as well or does SLES simply use the debian kernel that your Ubuntu host OS uses? Hi Scott. Running a SLES 11 Docker image on Ubuntu is really no different than running Fedora or CentOS on Ubuntu. To borrow terms form VMware that we’re both familiar with, the host OS’s kernel is shared with the guest OS. So yes, the SLES container is using the Ubuntu kernel. This is best seen by running “uname -a” from within the container and observing that the kernel version has “-ubuntu” appended to it. re: Are the Jenkins slaves running Vagrant? – No, the Jenkins slaves have Docker installed and their respective Docker daemons are listening on a public TCP port (port #4243). The Jenkins master uses the Docker plugin to contact that remote daemon and tells it to spin up a new container, which runs “sshd”. 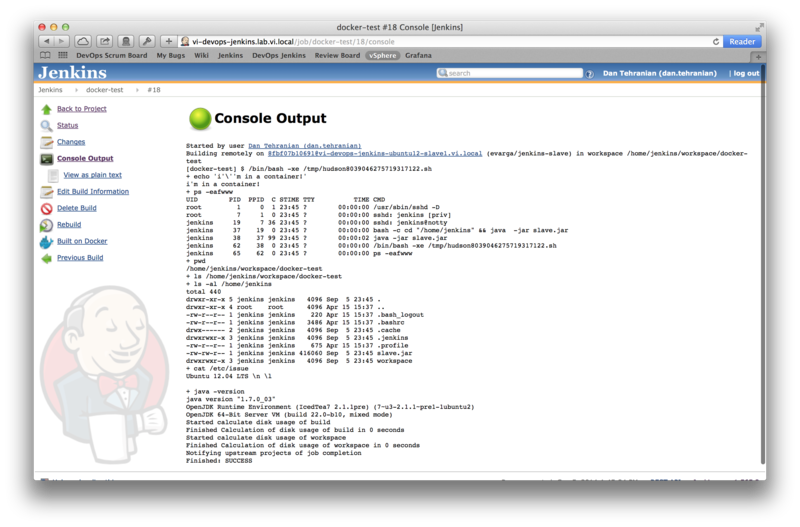 Then Jenkins can connect to that new container via “ssh” as the “jenkins” user. 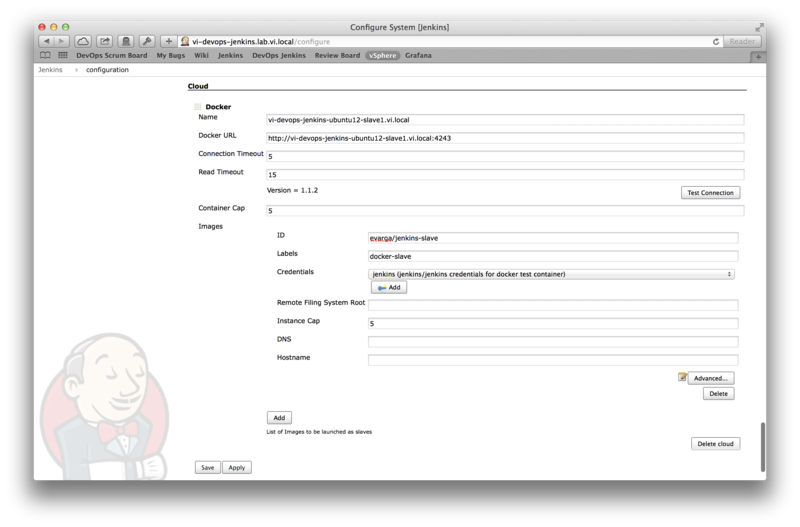 Would you mind sharing your previous one about the VMWare Jenkins Slave Dynamic Provisioning ? There should be high-level details in my LinkedIn profile under my VMware experience. We basically built Python automaton around vSphere 4.x’s APIs to provision linked clones on demand. Is there anything more specific you’d like to know about? Our plan is to have a number dynamic slaves forked on each job run, performing the tests on these slaves and tear them down after job is complete. I am trying things like pysphere, pyvmomi and Jenkins vSphere plugin..
Would like to hear your experience about those (or may be something else? ), what would you advise ? We used “pyvmomi”, which IIRC was still closed-source at the time (2010-2011). We had to write a custom solution instead of leveraging the Jenkins vSphere plugin because VMware was using a custom build system which pre-dated Jenkins. Once I’d left VMware and started using Jenkins, I did discover the Jenkins vSphere plugin and thought that it looked like a very compelling solution because it would save months of development work around writing the “pyvmomi” automation yourself. Ultimately I never had a need to use that plugin, but I’ve been following it’s development & changelog and it seems pretty mature. I would give that a shot if using multiple VMs are necessary. I was trying to test with version 1.5.0, though you have explicitly mentioned about 1.2.0+. But it fail to launch slave node, when trying to build on Jenkins. Thank you for the article. I was able to successfully set up the docker cloud provider and test button returns success, but confused on the settings for the actual Jenkins job. Can you post screen shot of how to use the evarga/jenkins-slave container to run a shell script? Thank you. Thank you Dan, I thought it was how that worked, and when I put the name in, it says 1 slave in instance, but when I run the build, I just get the build in gray saying: (pending—Waiting for next available executor). Does the container need to be started on the Docker host first? How does that bootstrap mechanism work? re: “Waiting for the next available executor” – Right, the Docker Jenkins plugin should automatically spin up the container on the host(s) you configured in your Docker Cloud. Which just gets repeated indefinitely till I cancel the build. Found solution: https://github.com/jenkinsci/docker-plugin/issues/215, you cannot specify docker version in the config. Thanks, This was really nice article. It really helped me to come up with following document.